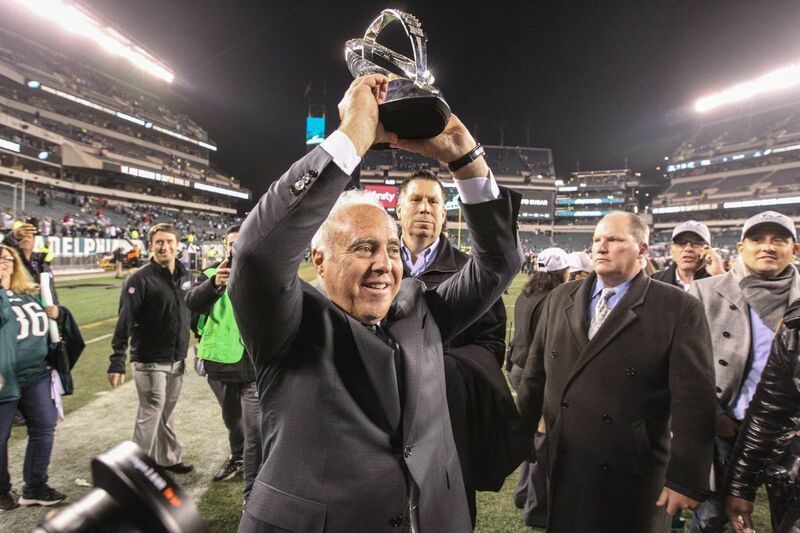 Eagle owner Jefffrey Lurie shows off the NFC Championship trophy to the fans at Lincoln Financial Field as the and the team walk off after beating the Vikings 38-7. BLOOMINGTON, Minn. – Jeffrey Lurie awoke at 4:45 a.m. Wednesday worried about a New England Patriots wide receiver drawing pass-interference penalties on the Eagles in the Super Bowl on Sunday. "I get obsessed with certain things," Lurie said. Lurie, who has owned the Eagles since 1994, rises at that hour every morning with some vexing Eagles challenge racing through his mind. It's not just during Super Bowl week, either. It could be late June, when the city's Eagles fever is at an ebb, and Lurie phones Howie Roseman about the nickel defense. Since 1995, the Eagles have won the sixth-most games of 32 NFL teams and appeared in the NFC championship game six times. Lurie has provided the Eagles with their most stable ownership in franchise history. Yet the Super Bowl remains elusive. That quest could be satisfied Sunday. The Eagles' second Super Bowl appearance since Lurie became owner is again against the Patriots, Lurie's childhood team and a franchise he once tried to buy. Quarterback Tom Brady has prompted Lurie's early-morning angst before. Lurie, 66, concedes that he's not up at that hour because of his over-the-top confidence in Nick Foles or satisfaction with the defense or bullishness about the offensive line. "I don't think about those things; those are all true," Lurie said during a wide-ranging interview with the Inquirer in the Eagles' Super Bowl hotel this week. "But I worry about what are we going to do with up-tempo on Brady's part. Will we be able to counteract that? Things like that. Are we going to step up in the A-gap and put pressure on him so he can't step forward? Those are the crazy obsessions, but they're real. And that's life." Professional sports ownership is a privileged existence, but it doesn't preclude Lurie from the same maniacal passion about the Eagles that has reached a crescendo in the region this week – and has been a hallmark of Philadelphia for more than six decades, since the Eagles last won a championship in 1960. Lurie is now 60 minutes away from what has become his white whale. "It dominates my life," Lurie said of winning the Super Bowl. "Every day, it's questioning, are we doing the things needed to give ourselves the best chance?" Lurie keeps a handwritten checklist next to his bed outlining what he believes is required for sustained success in the NFL. It long had five items, and in January 2016, he added a sixth. He has memorized the list by now, but he still reads it every month as a reminder. "Right in the drawer on the right side next to where I sleep," Lurie said. "If you open the drawer, it's the first thing you see. I can't open that drawer looking for something else without it staring me in the face. And it's on purpose." Lurie's tenets are a first-class practice facility; a football-only stadium; a dynamic head coach and leader who assembles a "great staff"; a "very good" football executive; a franchise quarterback; and "collaboration" and chemistry in the locker room and the organization. Lurie said he doesn't need to worry about the first two, although they were at the forefront during the early years of his ownership, when the Eagles played in Veterans Stadium and practiced in the parking lot. The final tenet was added to the checklist after Lurie dismissed Chip Kelly and hired Doug Pederson. He has become an ardent believer in the value that "player culture" and "coach culture" have in winning. It must extend beyond the locker room into the second floor of the NovaCare Complex, where the coaches and executives have offices. When Lurie discussed what he has learned since the Eagles last reached the Super Bowl 13 years ago, he first identified the "absolutely paramount importance of collaboration and a selfless locker room culture," which would align with the "emotional intelligence" trait that Lurie sought before hiring Pederson. "It's a collaborative culture that I think without it, you reduce your odds of winning big," Lurie said. Jeffrey Lurie holds up the NFC championship trophy while talking with Terry Bradshaw of Fox. Lurie's other lesson since the Eagles' last Super Bowl has been the evolution of the football operations role, which is why his post-Kelly decision to give Roseman control again in football decisions was so noteworthy, and his support for Roseman has remained steadfast. Lurie is adamant that the job is "so much more complex" than scouting players, and he thinks Roseman fits what's required in 2018. "You've got to be able to manage so much information that's available – whether we call it analytics; that's a one-word description for managing a lot of data, a lot of information," Lurie said. "With the advancement of technology and video and data, sport science is a big part of what we do, that's all about the maximizing the development of players." Lurie said the hardest item on the list to procure is the franchise quarterback, with the demand outpacing the supply and the quarterback's value so important. Carson Wentz fits that description for the Eagles, and this motivation was the bedrock for doggedly pursuing Wentz. Lurie added that the checklist should include a formidable second quarterback to go along with the franchise quarterback, which is where Foles fits. Lurie satisfied all those requirements this year. That's why the Eagles will be playing Sunday and there's optimism that 13 years won't pass until the Eagles play in the Super Bowl again. "I think we've got a great head-coaching staff. I think we've got a terrific head of football operations in Howie with his staff. I think we have the best young quarterback in football and another excellent quarterback in Nick Foles, as well," Lurie said. "It's the collaboration that you've got to re-create every single year. That'll be our biggest offseason goal, is to make sure we have excellent collaboration and improve the roster continuously." There's a certain irony in the Eagles' reaching the Super Bowl with Wentz on the sideline. More than anyone else, Wentz was supposed to be the one to finally deliver the Eagles a championship. "I guess there's irony, but there's also a satisfaction that we really prioritize that second quarterback," said Lurie, noting the financial investment the Eagles made in cutting Chase Daniel and signing Foles. The organization has prioritized the backup quarterback spot dating to Andy Reid's time with the Eagles. Yet so much of Lurie's pride about this current era of the Eagles is related to the 2016 trades to acquire Wentz, and he smiles at the recollection of identifying Wentz as their target that spring. Lurie accompanied Roseman, Pederson, offensive coordinator Frank Reich, and quarterbacks coach John DeFilippo on a scouting trip to Fargo, N.D., in March 2016. They took Wentz out to dinner after meeting with him, and they began to see that Wentz was the player they needed. Their instincts were solidified during a meeting after Wentz's visit to Philadelphia. Lurie said senior football adviser Tom Donahoe was also in the room when the decision was made; the Eagles had not yet hired Joe Douglas, who is now their vice president of player personnel. "We came to the unanimous conclusion," Lurie said. "I rely on the football people more than myself, but what I heard from all the football people in there is they thought Carson Wentz had the chance to be a very special quarterback, the highest ratings we gave a quarterback since Andrew Luck, checked every box from personality to talent to motivation, every box possible." Lurie agreed about doing "everything possible to get in a position to draft him," noting that the Eagles first tried to acquire the No. 1 pick before a series of moves allowed the Eagles to trade for the No. 2 choice. Eagles first-round draft pick Carson Wentz, holds his jersey with Eagles owner Jeffrey Lurie between executive Howie Roseman (left) and coach Doug Pederson. The impulse to find Wentz came about even before Lurie, Roseman, or Pederson watched him. In Pederson's first interview with team brass, he asked a question: . What did the Eagles plan to do about quarterback? The idea to be aggressive was a discussion point even in January 2016, although with the No. 13 overall pick at the time, it was uncertain Roseman could find the right quarterback. "When we spoke to Doug, it was all about wanting a great quarterback that was the face of the franchise, and we knew we could acquire players around that quarterback," Lurie said. "What's hard is to get a scarce-position player. A franchise quarterback doesn't come around very often." They also wanted to build up the offensive line to protect their young quarterback. Lurie remembered Jim Plunkett's arriving in New England as the No. 1 pick in the early 1970s, but Plunkett didn't succeed there because of the Patriots' offensive line, and he fulfilled his potential elsewhere. Lurie highlighted the pursuit of Foles last offseason. He has long been a Foles admirer – Foles' father said last week that "Jeffrey thought the world of Nick" – and emphasized that it's one of the most important roles on the team. "We never called him a backup, ever," Lurie said. "This is a guy who when he was with us played very, very well." Lurie can speak with knowledge on the Eagles' transactions. He's involved in the process, but doesn't make the decision. He wants to know how the decision was reached, though, whether it was drafting Wentz or signing Foles. "He's incredibly smart. He has a Ph.D," Roseman said. "He's going to ask the questions. Doesn't mean he's going to overrule it, but he's going to ask the line of thinking." Wentz's injury was a critical day for the franchise, yet Lurie emphasized the Eagles' resiliency this season by noting the other injuries, too. He called Wentz, Jason Peters, Darren Sproles, Jordan Hicks, and Chris Maragos a "fab five" of injured players – he added kicker Caleb Strugis in the category, too. "I've never been more proud of a team since owning the Eagles," Lurie said. "It's just amazing to see the coaching and the players' resiliency with the players we've lost." After a touchdown in the NFC championship game, cameras panned to Lurie in the owners' box. He celebrated the play by turning to his left and hugging his son, Julian, who graduated from Harvard last year. Football connected Lurie with his father, and it connects him with his son. "Julian and I, it kind of reminds me of my father and I, just talking football, and I've been teaching him the game since he was a little boy," Lurie said. "He's able to hear about all the dilemmas and decisions we make. I share a lot with him. The complexities of owning a team." Lurie, who has said before that he would like to keep the team in his family, does not have a formal role in the organization for his son or daughter, Milena. Lurie said they're "young and they need to prove themselves," and there's no suggestion that their influence will grow soon. But football and family go together for Lurie. HIs mother is 90, lives in the Boston area, is passionate about the Eagles, and will be at the Super Bowl on Sunday. Lurie lost his father at age 9, and football was their bond. He thinks about his father daily, but his heart tugs even more this week. "I learned to love the sport through his eyes on a black-and-white television," Lurie said. "Here we are on the precipice of the same type of championship games I watched with him when I was a little boy. And imagine how proud he would be, but at the same time, he would want me to remain the person I hope I am." Eagles owner Jeffrey Lurie hugging Jeremiah Trotter as he leaves the field after a game in January 2002. That second part is important to Lurie, and in the past two decades, Lurie insisted the Eagles' role in the region go beyond 16 autumn Sundays. The Eagles' charitable efforts have ranged from vision care for children in Philadelphia to community service Mondays for players to their latest initiative, the Eagles Autism Challenge, a city-wide cycling and 5K event in May to raise money for autism research. Lurie's brother is autistic and Lurie has become increasingly outspoken about the cause, including a widely circulated editorial he wrote last March. Lurie has been supportive of players' using their platforms to promote social change. Malcolm Jenkins, Chris Long, and Torrey Smith have been at the forefront. Lurie said the Eagles are a "very urban franchise" and he encourages the team to be mindful of inequality in the region. He wants the team's community efforts to remain an organizational pillar. "It starts with trying to win a world championship. Everything is second to that. That's our constant obsession," Lurie said. "At the same time, I would be disappointed if every year we weren't a very good community-dedicated team. To me, owning a sports team, you've got to be a great partner with your city, fan base, and region. If you don't do everything you can within your community, it'll be disappointing. They're not mutually exclusive. They actually go very well together." Beyond any efforts the Eagles can make in the community, though, there's nothing that affects the region's morale more than the Eagles' on-field performance. This past month has been an example. When Lurie bought the team for a then-record $185 million 23 years ago, he said he wanted to be considered a fans' owner "because you really get great satisfaction when you can go out on the streets and scream you're No. 1 and you're world champions." That has not yet happened. In 2014, at the 20-year mark of his ownership, he said that "nobody feels the sting of not winning the Super Bowl more than me or any of the people that work here." Long-suffering fans throughout the region can provide good competition, though. They can relate to waking up in the early-morning hours worried about the Patriots. The Eagles have reached the doorstep of the Super Bowl often with Lurie, and they have knocked on the door once before. But the patience for a parade is tested every year. That's why Sunday matters so much. "Nothing would bring me more joy than to win on Sunday and bring a championship to Philadelphia," Lurie said. "That's what I think about every single day of the year."